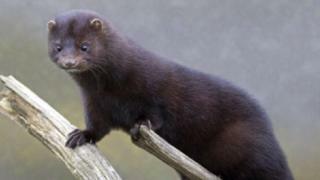 A fresh bid to rid Anglesey of the American mink has been launched. The non-indigenous predator was introduced into Britain in the 1920s for fur farming - but many escaped into the wild. They have been blamed for decimating populations of lapwing birds and water voles. A project was launched on the island a number of years ago to tackle the problem and conservationists have now received £49,000 funding. The money will be used to track and trap minks, while volunteers will be recruited and trained to monitor riverbanks where mink and other wildlife live. Dafydd Gruffydd, managing director of enterprise agency Menter Mon, said: "This project is key to the survival of the water vole on Anglesey." In 2015, Anglesey was declared "grey squirrel free" after the animals were culled to protect the island's native red squirrels.